Hey there Summer.... how you doin? I think I have been dreaming of Summer ever since well.... the first day of Fall last year. HAHA! I am a sucker for warm weather and luckily in NC, it comes fairly early. It also means our wardrobe needs to be heat-friendly. When I told my girls the name of the new pattern I was testing, they squealed. "Like the Barbie?!!" Haha!! Thus, inspiration struck and I fished out my Michael Miller fashion girls and found mix and match coordinates in my stash. As I was gathering coordinates, I found my leftover denim from her Monster Mash Pinny (One Thimble | Issue 19) and thought it would look fabulous as shorts for the Malibu Top version. 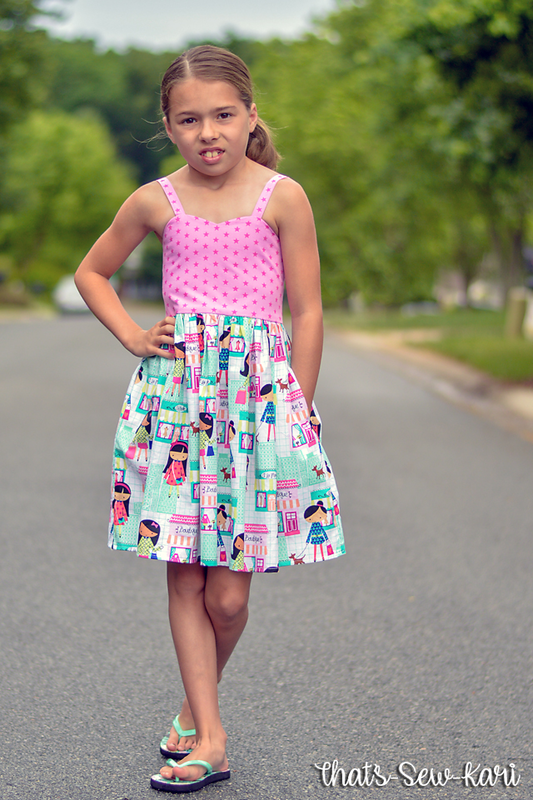 My 7 year old quickly claimed these fabrics for her outfit but was very specific on which pattern I was to sew for the shorts. She chose the Beaufort Shorts, sans ruffles. These shorts are SO quick!!! Of course, I had to add my own detailing so I made bias from my leftover denim, but sewed it on so the wrong side faced out. Then I did the same with the waist. I adore the contrast it gives! I used the larger MM print on the dress and of course added in the optional pockets at the seams. 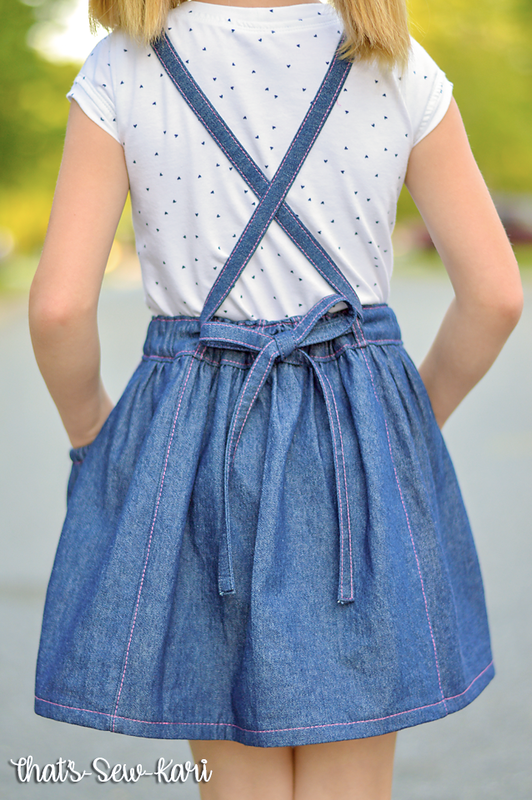 The bodice is a great way to add in a coordinate or take care of some of your scraps. These girls are feeling FAB in their new threads. Grab your copy today!!! Usually when I want to sew a pattern, I print out the pattern pieces, cut out the pattern pieces, lay them out on my fabric, weight them down, cut them out of the fabric, and so on and so forth. It's tedious, y'all! 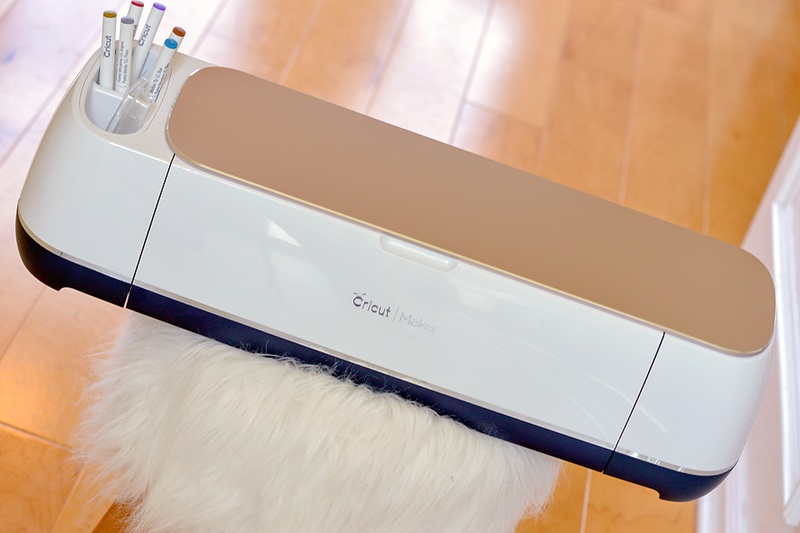 Enter the Cricut Maker who was smart to bring on Simplicity and its hefty arsenal of patterns (or at least the ones with pieces that fit on a 12"x24" mat -- 471 and growing). 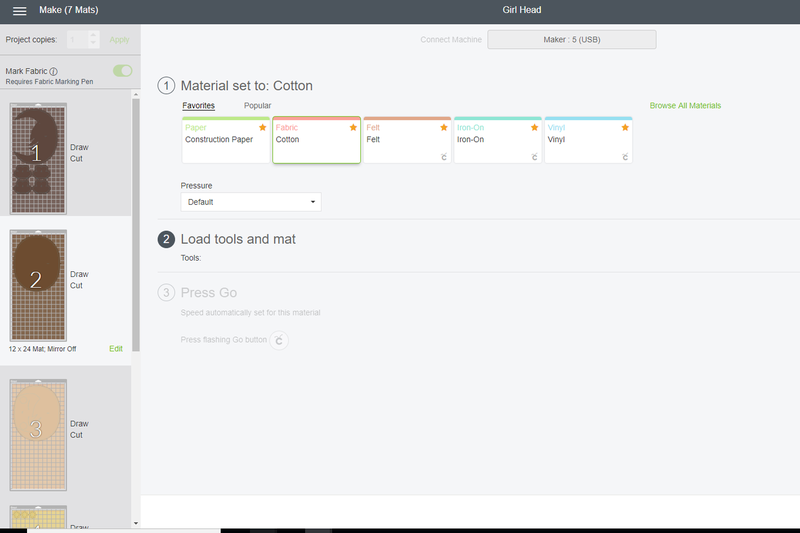 Now, I literally click a pattern to make, put my fabric on my mat, and press a button. Easy peasy! 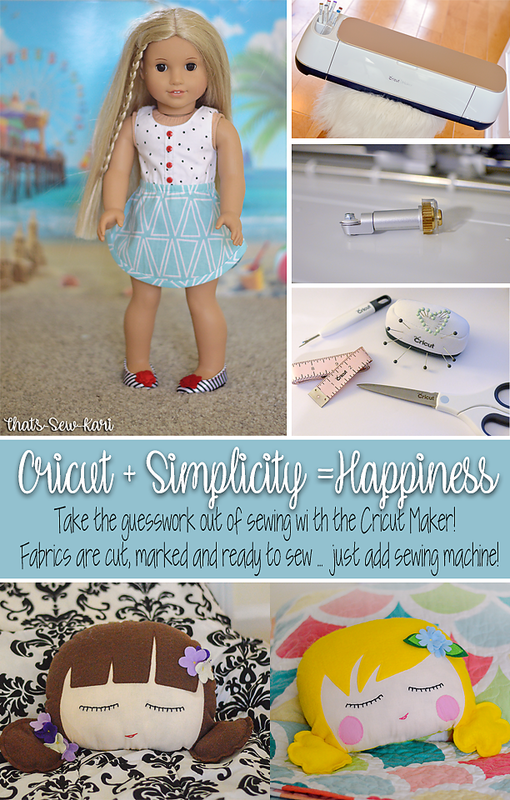 Ever since I saw the Maker on social media, I knew I wanted to use it to cut doll clothes. The pieces have tight curves and with a 1/4" seam allowance, there is no room for cutting errors. 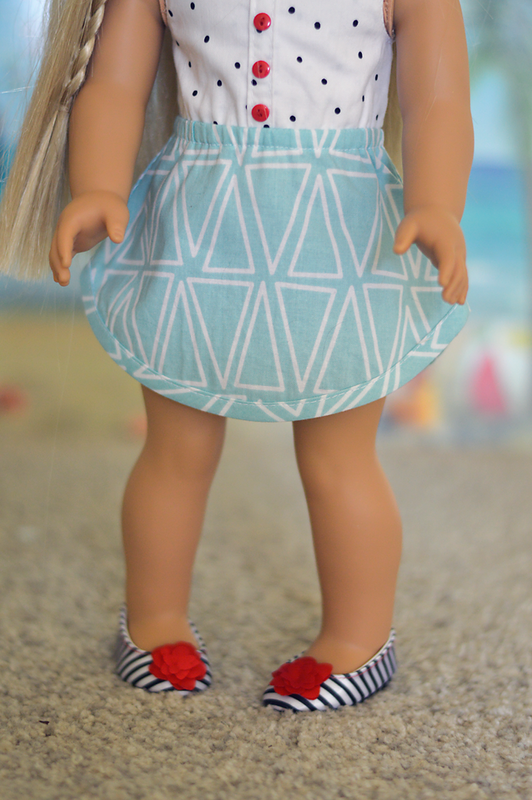 First, I chose to sew up the Doll Button Up Dress by Simplicity. I used Creative Rockstar by Riley Blake Designs from the Cricut Designer Sampler Packs and tried the new Brayer to smooth out my fabric. This pattern has just two mats to cut. Your skirt pieces will cut first so place the selected fabric on your pink Fabric Grip mat, right side down. Using your Brayer, smooth out the fabric on the mat. Make sure your rotary blade and fabric marker are installed on your Maker. 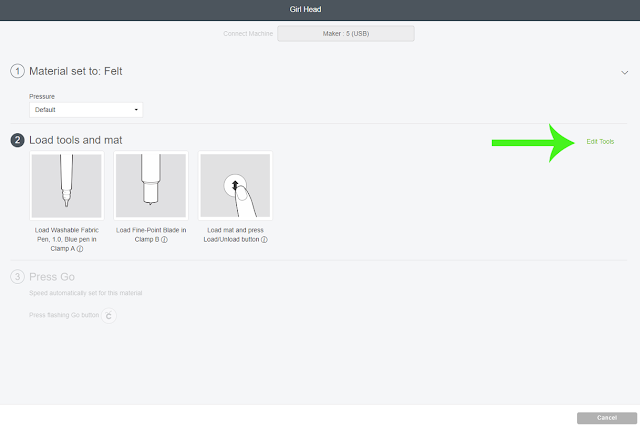 Choose the Cotton Setting, load and press Go. Remove from mat. Repeat the process with your second fabric selection for the bodice pieces. Per the instructions PDF, create the faux button placket on the Main Bodice. Top stitch in place. Place Main and Lining right sides together. Iron the shoulders of the Lining down 1/4". Sew the top curves, leaving the shoulders open. Clip notches into the corners (pinking shears not recommended here). Carefully turn right side out, press the curves well. Join the Main Bodice shoulders together on each side and sew the Main fabric (RST) together only, being careful the lining is not caught in the stitching. Press open the seams and tuck ends under the lining. 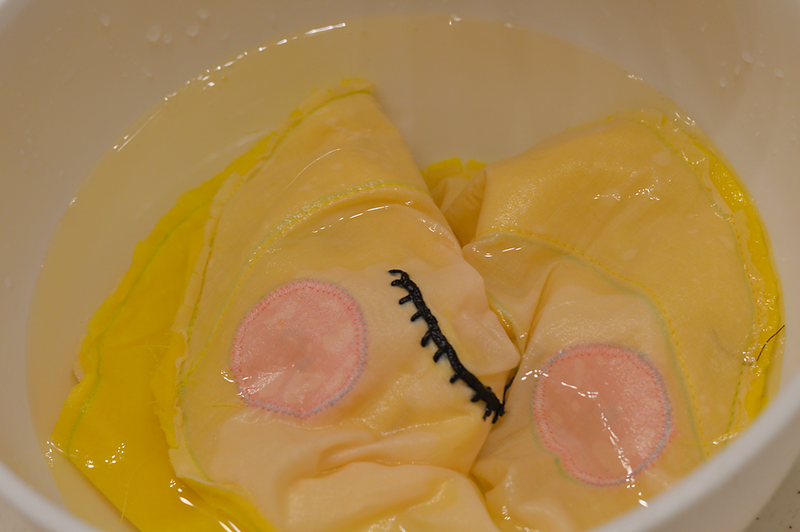 Using a needle and thread, hand sew the Lining shoulders together with a slip stitch. Top stitch around neckline and armholes. bodice aside. Finish the center straight edges of the Back Skirt pieces with a zig zag stitch. Place pieces RST, matching the notch. Starting from the bottom with a 1/2" seam allowance, sew up to the notch, turn and sew through the middle of the notch. On the right fabric piece only, cut a notch to the stitching at the pivot. Press the seam below the notch open. Press the seam above the notch to the wearer's left. Next, you will add bias tape to the hem. The PDF will have you slip the hem into the folds of the bias tape and sew. I prefer to sew one side of the bias onto the back side of your fabric and then refold the bias tape over to the front before top stitching in place. The bias tape is visible, as shown below. Place Skirt Front and Skirt Back RST and sew side seams. Finish with zig zag or serger. Press seams towards back. Top stitch in place. Begin pinning the bodice to the skirt, matching the unfinished Center Back of the Bodice to the Middle of the Skirt Back. Match the side seams with the circles marked on the bodice. Sew with a 5/8" seam. Trim Skirt and Main Bodice seam allowance, leaving just the Bodice Lining. Press lining under 1/4" and press seam down towards skirt. Top stitch in place. Add elastic, securing it on both ends. Zig zag Bodice Back Center edges. Separate the Hook and Loop. Attach the rough side to the Right side, top stitching along the long edges. The soft side will be sewn to Left Side. Sew along the inner edge only. Flip the Left edge under, creating a placket. Top stitch along the remaining edge of the hook and loop. Close the Hook and Loop and sew along the bottom edge (horizontally). Hand sew 4 small decorative buttons on the front bodice where indicated. Soak or run under cold water to remove the Cricut Maker Fabric Pen markings. Dry. 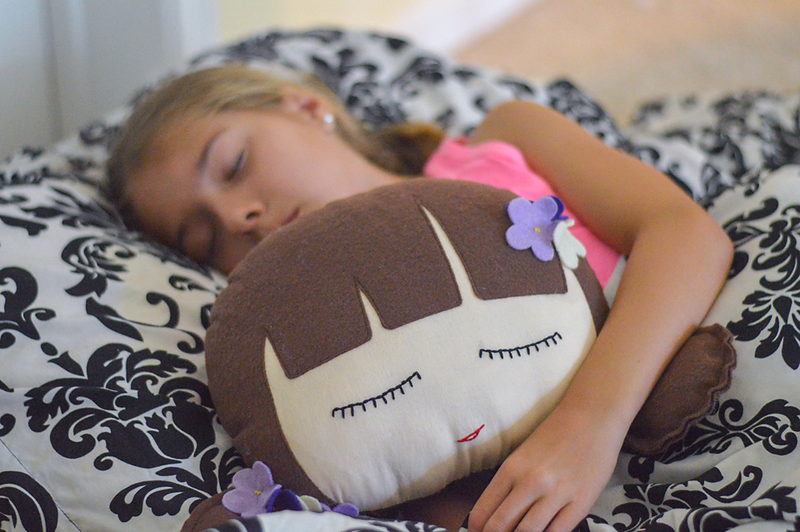 Next, I sewed the two most adorable pillows ever! 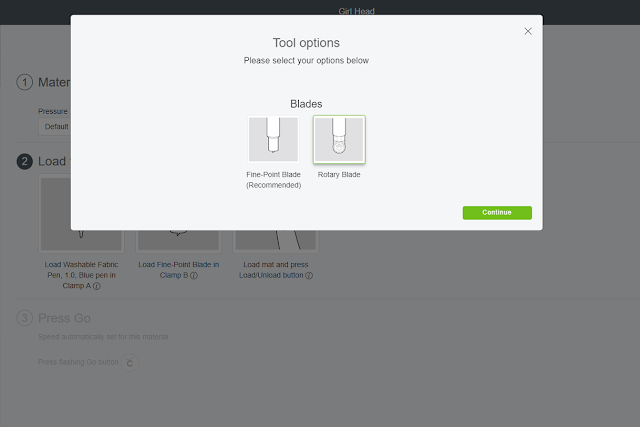 Depending on which file you choose, you will have a different number of mats to cut. Place material, right side down on Pink Fabric Grip Mat. Load your Fabric Pen and Rotary Blade. For cotton fabrics, choose (or switch to) Cotton under Materials. For Felt, choose (or switch to) Felt. When you choose Felt, it will default to the Fine Point Blade. 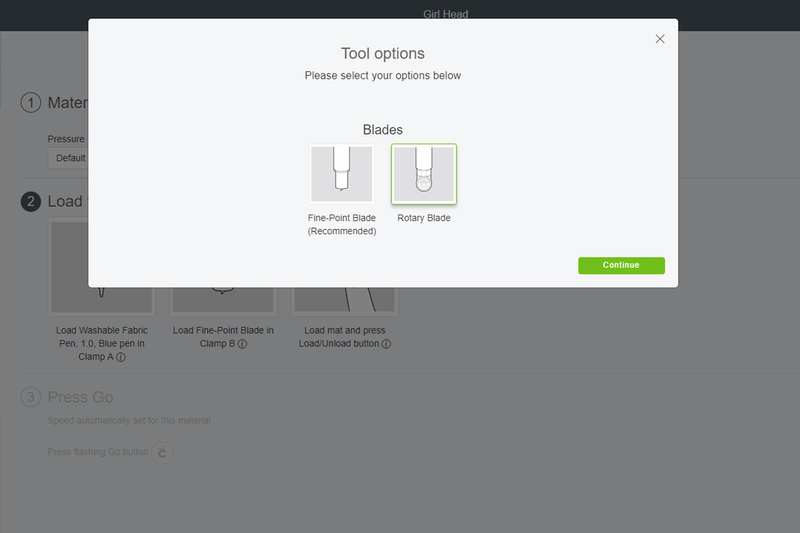 You will want to switch to the Rotary Blade (trust me on this one...lol) by selecting Edit Tool on right side and then selecting Rotary Blade. To switch Materials between Mats, click the drop down arrow on the right side of the screen and then select the correct material for that mat. You will embroider you eyelashes and mouth using your embroidery thread and needle. 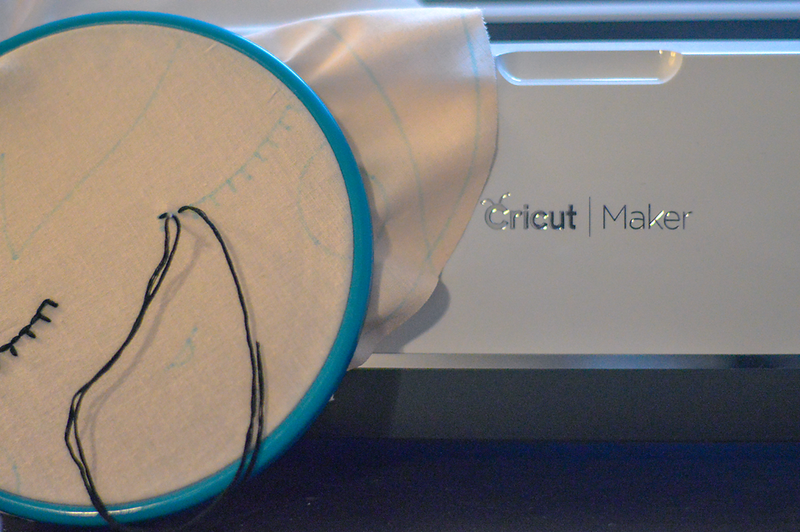 I prefer to secure my fabric in an embroidery hoop first so the fabric is taut. Remember the Fabric Marker will be on the back side. Grab your Felt Hair and line it up on the Face. Pin in place and top stitch along the hair line. Baste along the outer edge. To sew perfectly in a straight line, switch to your blind hem foot and use the guide to run along the edge of the hair. 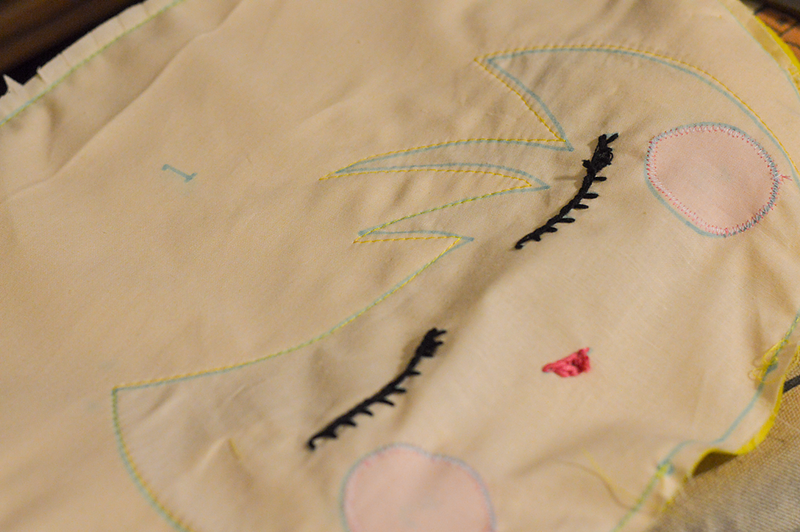 If your pillow has cheeks, attach in place using a satin stitch. Place two of the Pigtail pieces WRONG sides together and sew along the marked Seam Allowance, leaving the straight edge open. Lightly stuff with polyester fiberfill. Baste the straight edge shut. Pin in place, matching the markings on the hair. Baste. If you'd like to get creative with Pigtail placement, go for it!! 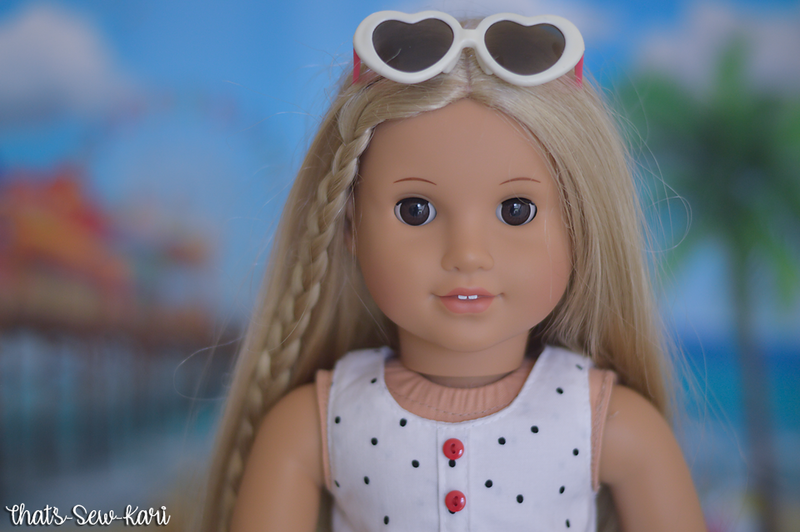 My girls REALLY wanted their pigtails to be up higher on the head (like they normally wear), but for the purpose of this post, I kept it original to the pattern. Place the Front Face and Back Hair RST, matching up the notches and markings. Pin to secure. Sew to attach, leaving the bottom space open between markings. 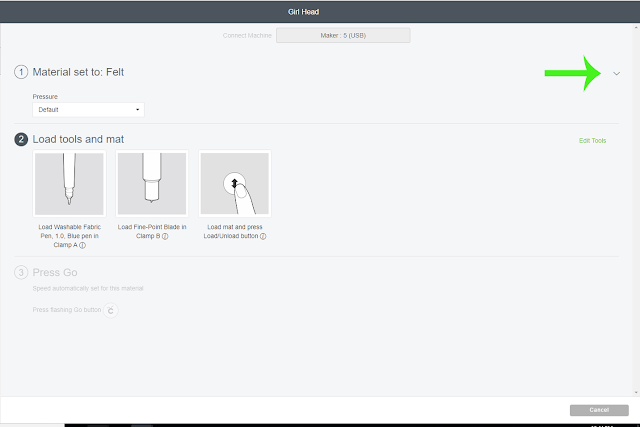 Clip rounded edges. Turn right side out. *I air dried the pillow overnight. I was afraid the dryer would melt the felt. Stuff your pillow with LOTS of polyester fiberfill. I put 8oz in each pillow, a little at a time. 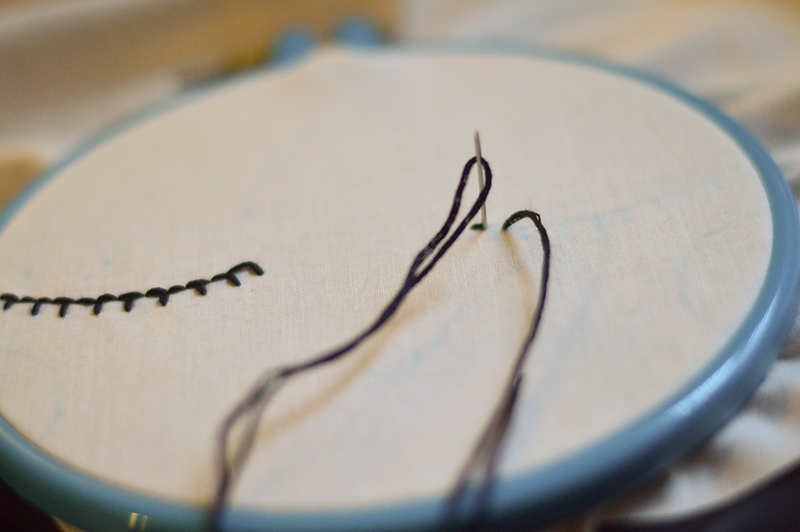 Using the ladder stitch, close the opening on the bottom. 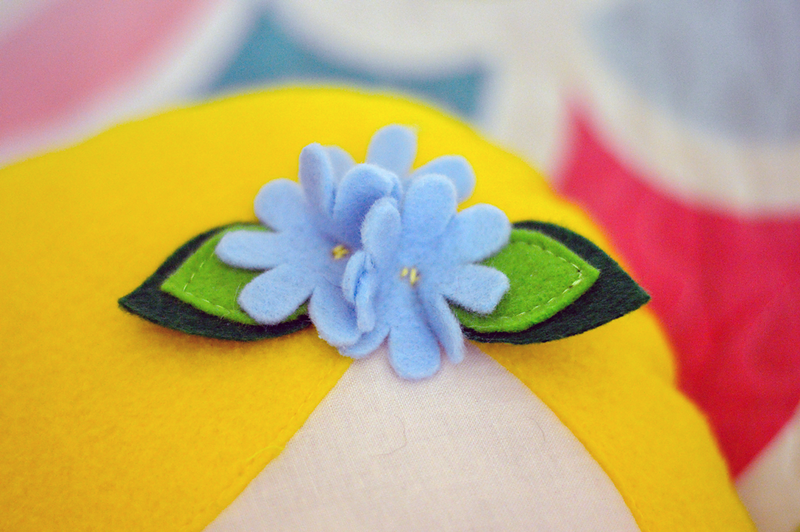 Using your embroidery needle and thread, attach the flowers in place. If you are sewing leaves as well, attach the smaller leaf to the larger leaf using the sewing machine. 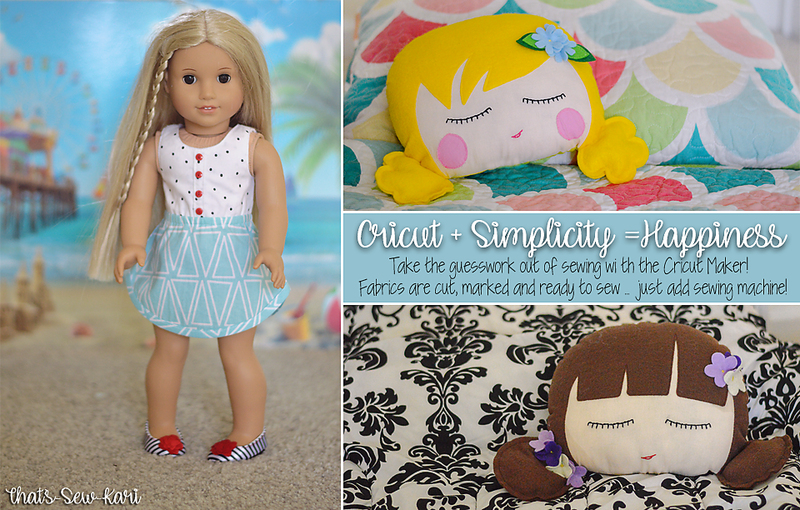 I hope you take some time to browse the Simplicity Library because there are SO many awesome patterns (prices seem to range from $2.99 to $5.99). I absolutely loved creating these and I know I will be sewing more! 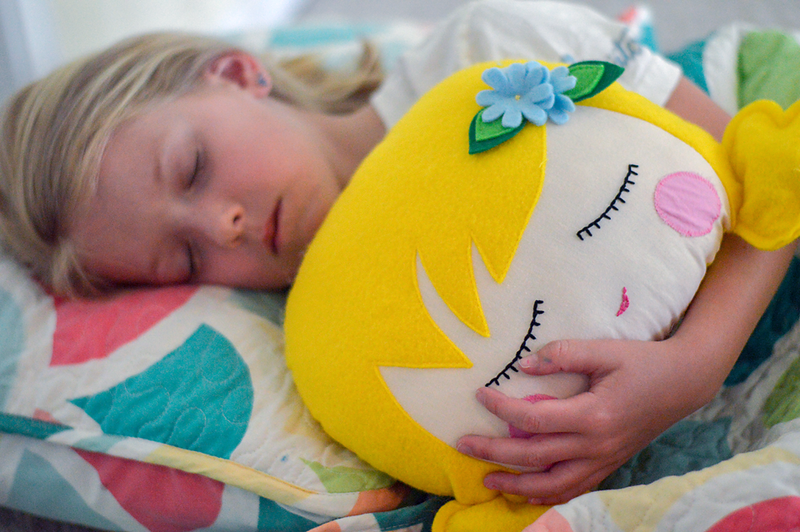 I am hoping the pillows are a good beginner's project for my girls to try to sew this summer. What?!! I'm so excited it's One Thimble Time! Time to PLAY!!! Issue 19 is such a fun-filled issue! 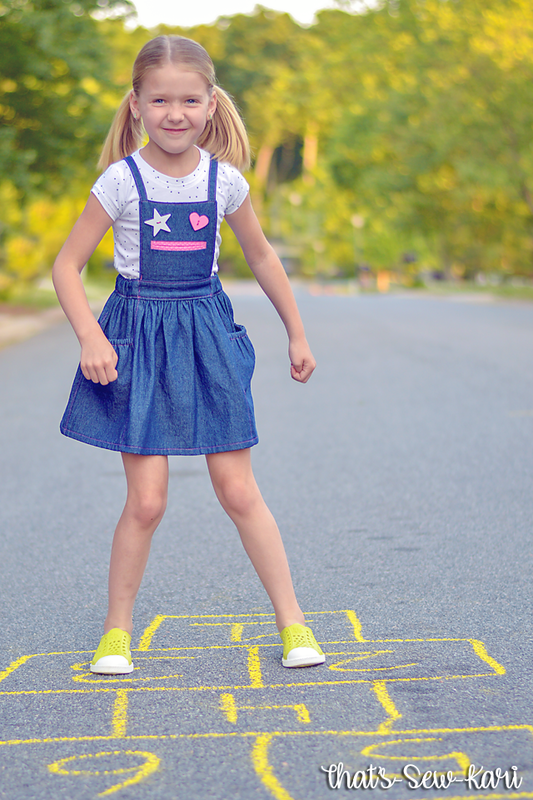 The issue is filled with playful patterns to send kids' imaginations into overdrive. From Dixie the Silkie Chicken to the Beep Beep Sweatshirt to the Take and Play Wall Hanging, there is a pattern for kids of ALL ages! 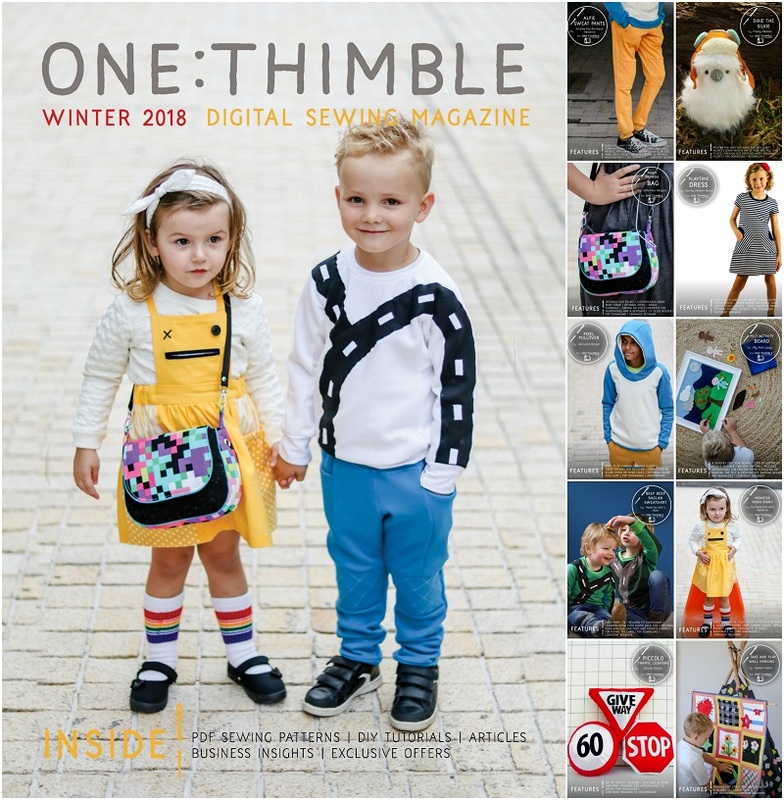 In case you are new to One Thimble, it is a quarterly digital sewing magazine with about 10 or more sewing patterns and several inspirational articles and quick tutorials. This issue has 10 patterns and 28 articles. The cost for everything is $25 AUD (which is $18.84 USD) -- that's just $2.50 AUD per pattern ($1.88 USD)!! The early bird gets the worm too -- get some fun freebies if you order by May 14th! Click here to grab your copy! There are a whopping 28 articles in this issue. I will share my thoughts on my favorite articles! The chart in the e-zine (looks like the one pictured) is hyper-linked in the file so you can click the article you want to read and are there in a click of the mouse! Zip Lines by Mr. Fox had me laughing so hard. I hope he has some thoughts in the next few issues because he is hilarious. Of course, I always appreciate a sneak at next issue and oh my gosh!! The theme is surf's up and I can hardly wait. I love that this issue has several articles about involving kids in sewing. 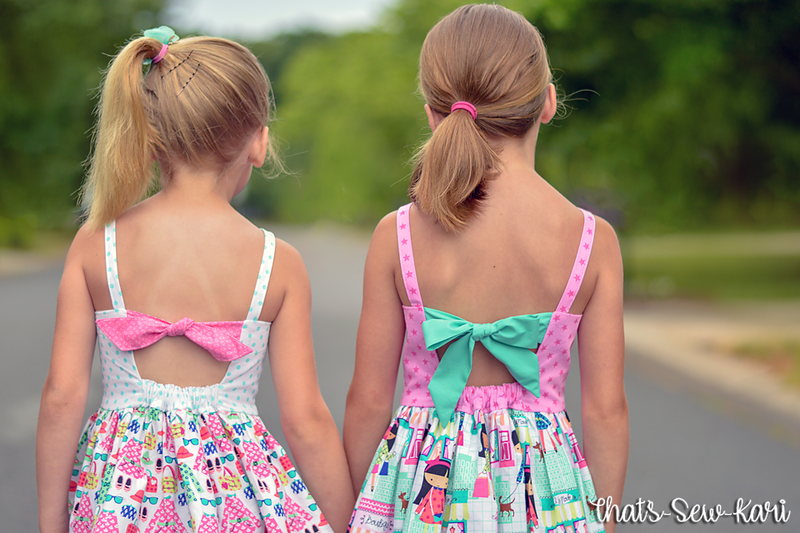 My girls have both been asking me to spend time teaching them so this summer I will be using the Kids Sewing Projects to get them more confident. I am hoping to involve them in freezer paper stencils too -- eek, I've yet to try freezer paper stencils (don't tell anyone...LOL). 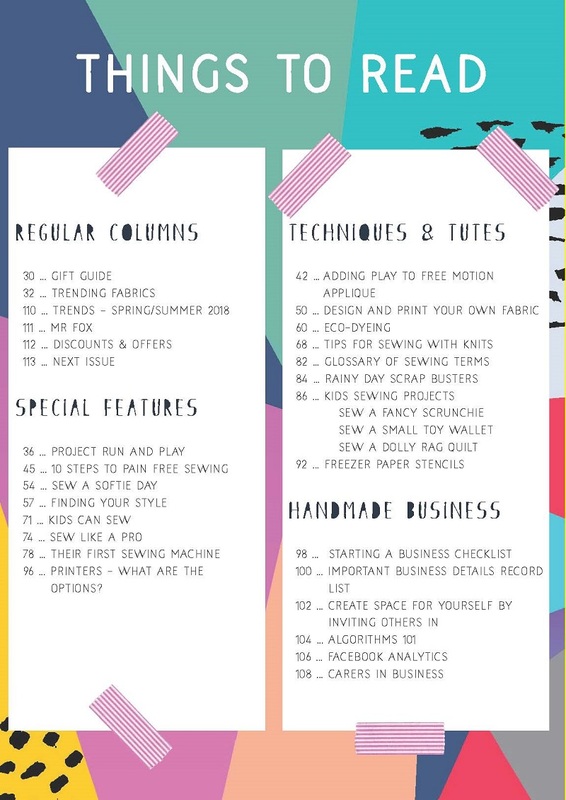 I appreciate the included articles on handmade business because although I am not running a sewing business, I can translate some of the articles to apply to my blog. Of course, there a loads of other articles too. These are the ones that resonated most with me. The first pattern I chose to sew was the Monster Mash Pinny by Duchess and Hare. 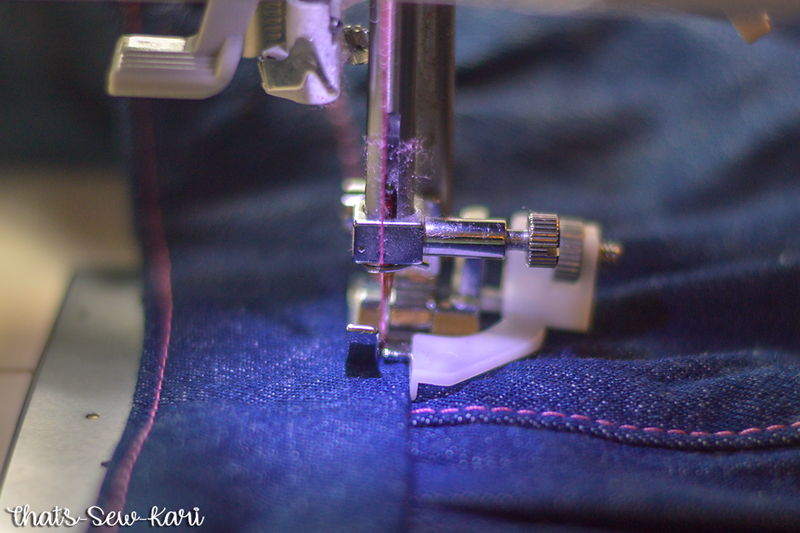 The moment I saw the line drawing, inspiration hit and I knew I wanted to sew a denim version. I thought the face would really pop against the blue background. Of course, if your daughter isn't the whimsical type, you could always forgo the monster face. In lieu of embroidering an X for one eye, I chose two oversized fun buttons for his eyes. His mouth is a functional welt pocket and my first ever!! YAY! This pattern came together SO easily. Every single thing fits perfectly together and I was so thankful to see pattern pieces for everything. I love them even for rectangles. The measurement chart was very handy too. I consulted the chart before sewing and determined that my daughter measures into a 3 width and 5 length. However, upon checking the finished length, I determined I'd rather use the 3 length on the bottom because I prefer it to hit mid-thigh rather the knee as it was drafted. I did utilize the 5 length on the bib portion though. I love the simplicity of the back. I chose to topstitch all my seams in a bright pink. To sew a perfectly straight topstitch, lengthen your stitch length (I love 3.5) and switch to your blind hem foot. 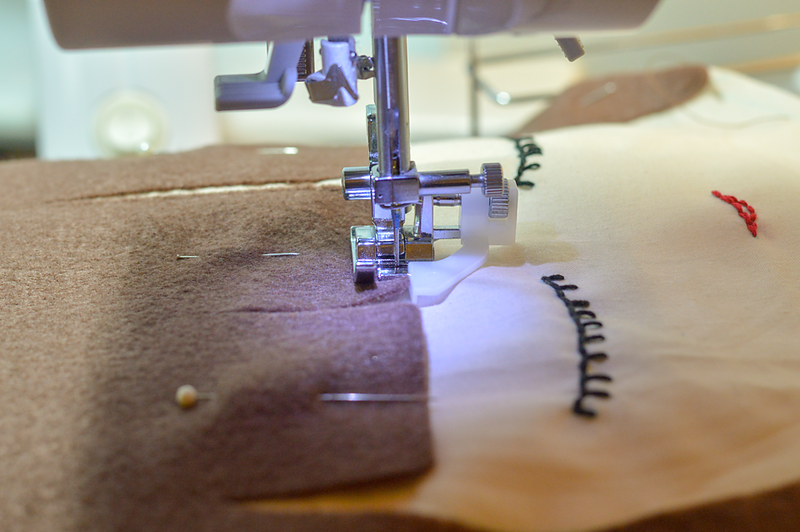 Then, use the guide to run along the edge or seam you are topstitching. 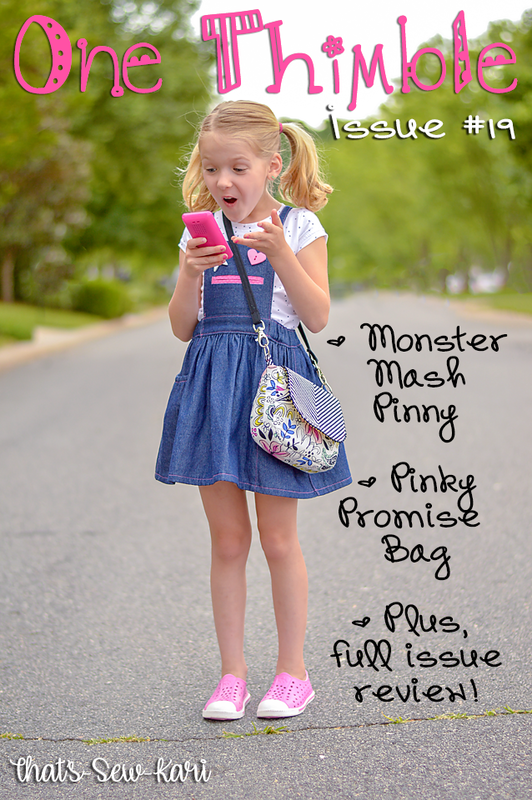 Next, I chose to preview the Pinky Promise Bag by Little Moo Designs and I am so in love! This is the perfect sized purse and Miss 7 promptly took it to Art Night at the school to show off to all her friends. I really loved the cut chart that told you exactly what each of the cuts were needed. 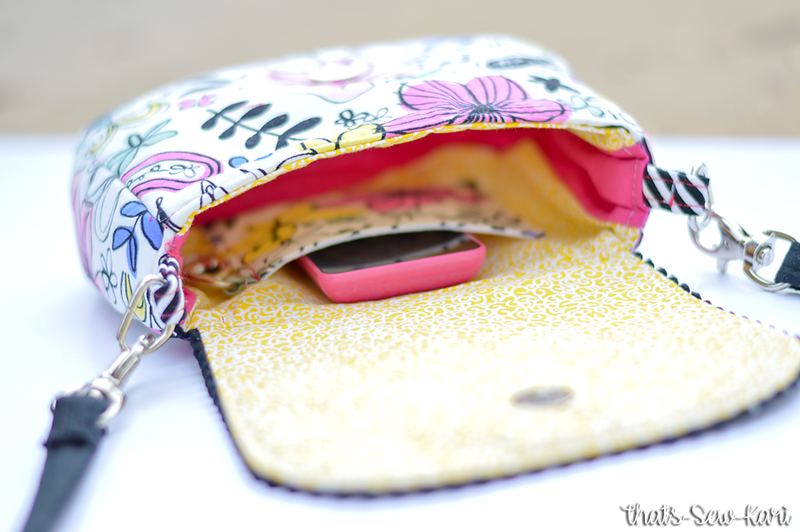 This bag is a great way to use up scraps. 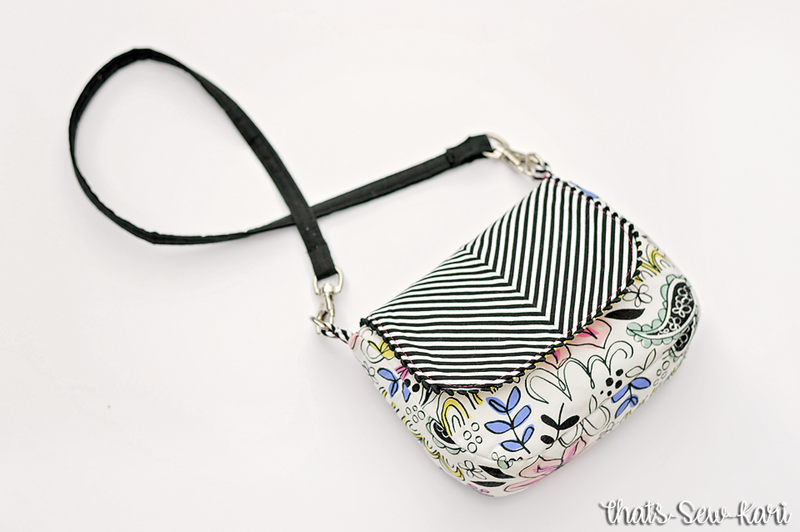 This bag is made from scraps from my Issue 17 post! It even comes with a little pocket inside and I added the hardware for the optional chapstick holder. In order to beat the rain for pictures, I had to wait on the bonus chapstick holder. I will add the picture after I sew it up. My oldest daughter loves it too! She has already put in an order for one. I think I will surprise her and add in a coordinating Playtime Dress! I have a few projects on my to-sew list this summer for my Pre-K classroom because the Take and Play Wall Hanging and Felt Activity Board would make great additions in my classroom. Check out these stops for more One Thimble inspiration!